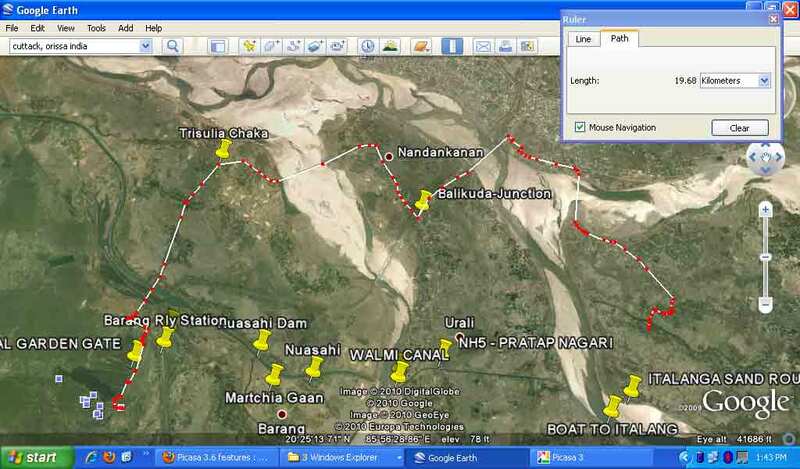 AS per our Nandan Kanan Zoological Park , Biking trip last time I forget to mention the tools we had used to mark our spots and the routes precisely with the help of Euro sat , Google earth. A detail analysis of these three images from the outer space, makes us thinking the best utility in the terrains. So we done with the three routes , enjoying each bit of it. The 3rd image was the tred setter for our biking rides, as it shows that we traced the best and shortest possible route out of the three we explored that day. We save 9.3 km in the 3rd route ( through two river crossing).
" Itna tu kyoun soche , main aage tu peeche , bus aab nikalte hain kaya ???" Current Song : Demelo !